A Canarsie, Brooklyn, native, Jonathan Supranowitz, vice president of public relations for the New York Knicks, shared with students how he rose through the ranks to where he is today. 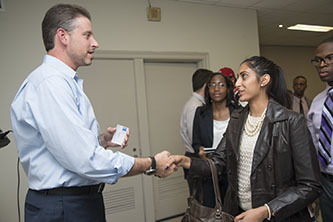 New York Knicks Vice President of Public Relations Jonathan Supranowitz '94 meets with students who packed the room for his talk. As part of a continuing series, the Magner Career Center invited Jonathan Supranowitz '94, vice president of public relations for the New York Knicks basketball organization, to talk about his road to success. A Canarsie, Brooklyn, native, Supranowitz has been with the Knicks for 14 seasons, beginning in 2000. "It's important that you love whatever you choose to do for a living," he advised, "because you're going to be doing it for the rest of your life." Regaling his audience with anecdotes about the types of crises he has had to face as a public relations manager in the age of Twitter, Supranowitz spoke, too, about the beginning of his career, when he accepted most of the internships he was offered with sports organizations—despite the fact that he was majoring in mathematics. For Supranowitz, those internships were the best way to learn the trade he loved. They also helped him network in the days before social media. "It was a different era," he said. Still, some things haven't changed. Doing an internship in one's field of interest still works, Supranowitz emphasized. He had not yet graduated when he started, in 1992, with the New Jersey (now Brooklyn) Nets. There he worked as a public relations intern with no pay. He was already known in the pro basketball circuit when the Charlotte Hornets were looking for a public relations manager three years later. He spent five years in North Carolina with the Hornets before the Knicks offered him a job. According to the Magner Center, 63 percent of college graduates nationally complete at least one internship before getting recruited to a full-time job. Meanwhile, only 37 percent of Brooklyn College graduates complete even one internship, in part because they cannot afford to work without pay, which many internships often require. Thanks to the generosity of alumni and other donations, the Magner Center is able to offer stipends ranging from $1,000 to $5,000 for students who have been accepted to internships. The stipends relieve the students of having to search for a paying job and allow them to focus on their careers, said Natalia Guarin-Klein, the associate director for internships and alumni programs at Magner, who was on hand to hear Supranowitz speak. "Events like this are invaluable for our students and often change the course of their lives," she added. Also attending was Charles Rogers '15. "I came because of the Knicks and because I am interested in sports," he said. "But I also like to hear people's backstories, how they got into things—especially a field like sports. It's not easy to get into on any level. I can relate to Mr. Supranowitz's wanting to do something in his chosen field no matter what anybody told him," he added. "That was inspiring to hear."